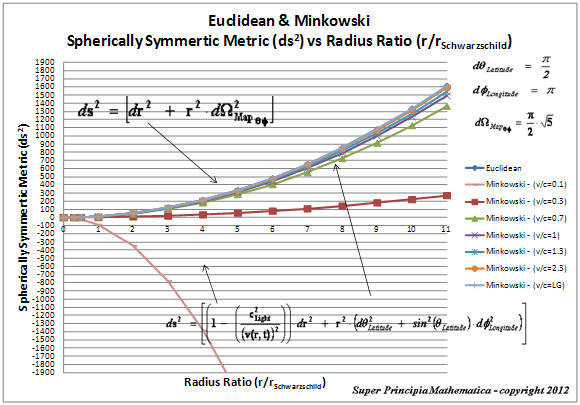 This paper described a new algorithm, for “generalized mathematical formalism” of a “Spherically Symmetric Metric” ( ), that describes the Euclidean Metric, Minkowski Metric, Einstein Metric, or the Schwarzschild Metric; using Three (3) Metric Components & Three (3) Metric Coefficients; and likewise using a general algorithm which is composed of, Two (2) Metric Components & Two (2) Metric Coefficients. In this paper a general introduction to basic mathematical concepts for the geometric description of Euclidean “Flat-Space” Geometry and Non-Euclidean “Curved-Space” Geometry, and Spherically Symmetric Metric equations which are used for describing the causality and motion of the “Gravitational” interaction between mass with vacuum energy space, and the mass interaction with mass. This work is written to physicists that are interested in understanding from a conceptual view, the description of “Flat Geometry” Euclidean Space, or “Curved Geometry” Non-Euclidean Space, for describing causality for gravity motion, and the “Gravitational” interaction between mass with vacuum energy space, and the mass interaction with mass. In this work I have limited the discussion only to the: Euclidean, Minkowski, Einstein, and Schwarzschild Spherically Symmetric Metrics, and geodesic line elements, of space, space-time, or the gravitational field, however there are many other geometric “metric” equations, and theories of gravitation, that are accepted by the mainstream physics. 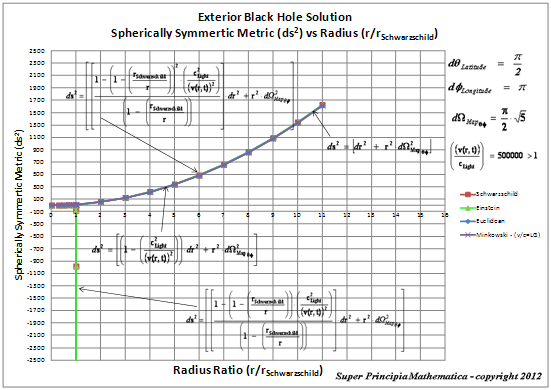 And there are many “Spherically Symmetric Metrics” that are in use in physics today. The “Spherically Symmetric Metric” ( ), and the “Geodesic Line Element” ( ), are used for describing the “flat” or “curved” Differential Geometry of Space, Time, & Surfaces, of spherically symmetric space, space-time, or gradient gravitational field, in the presence or absence of condensed mass, matter, or energy. In this work, a new algorithm, for “generalized mathematical formalism” of a “Spherically Symmetric Metric” ( ), that describes the Euclidean Metric, Minkowski Metric, Einstein Metric, or the Schwarzschild Metric; using one general equation which is composed of, Three (3) Metric Components & Three (3) Metric Coefficients. And likewise there is a general algorithm which is composed of, Two (2) Metric Components & Two (2) Metric Coefficients. The Four (4) Metric Components & Four (4) Metric Coefficients algorithm is the current model used by the mainstream literature, and physics community; today. A “Spherically Symmetric Metric” ( ) is used for describing the “gravitational interaction” of a “flat” or “curved” Differential Geometry of Space, Time, & Surfaces, of spherically symmetric space, space-time, or gravitational field, in the presence or absence of condensed mass, matter or energy. 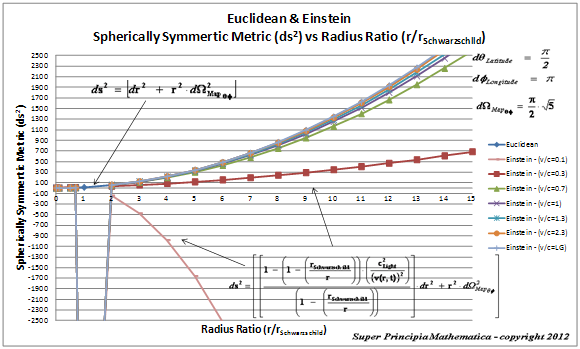 Next, a new algorithm, for “generalized mathematical formalism” of a “Spherically Symmetric Metric” ( ), that describes the Euclidean Metric, Minkowski Metric, Einstein Metric, or the Schwarzschild Metric; using one general equation which is composed of, Three (3) Metric Components & Three (3) Metric Coefficients. In the modern literature of General Relativity (GR), it is common mathematical formalism, to use a Einstein tensor mathematical expression, in order to describe, a generalized Spherically Symmetric ( ). 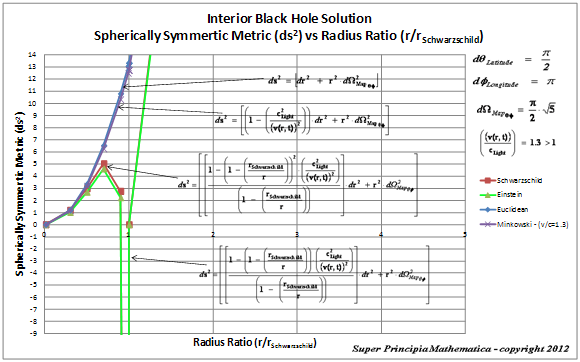 Using the Einstein tensor mathematical expression of General Relativity, it also can satisfy the, Three (3) Metric Components & Three (3) Metric Coefficients, algorithm, for “generalized mathematical formalism” of a “Spherically Symmetric Metric” ( ). 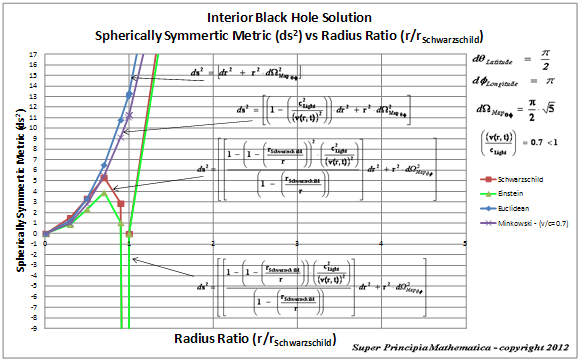 For starters, let’s consider the following space, angle, and metric mathematical relations for a perfect fluid spherically symmetric gravitational field. Next, we will present a new algorithm with a “classical mathematical” description of “generalized mathematical formalism” for describing the Spherically Symmetric Metric ( ) that describes Differential Geometry of Space, Time, & Surfaces, of a perfect fluid, spherically symmetric space, space-time, or gravitational field. 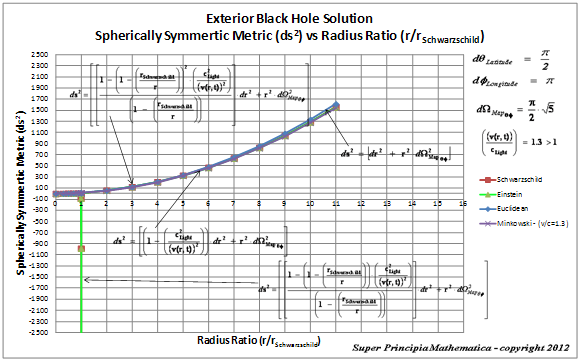 Using either the Euclidean Metric, Minkowski Metric, Einstein Metric, or the Schwarzschild Metric, a Three (3) Metric Components & Three (3) Metric Coefficients, algorithm, for “generalized mathematical formalism” of a “Spherically Symmetric Metric” ( ), is discussed below. 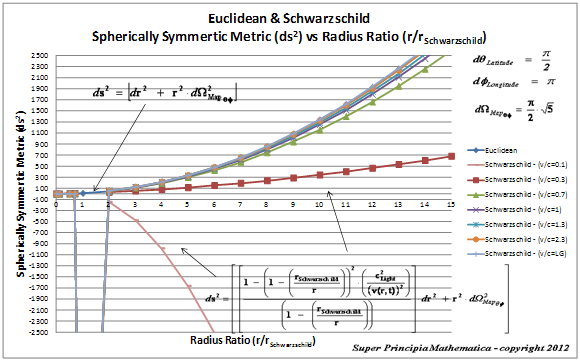 The “Metric Coefficients” of the generalized Spherically Symmetric Metric ( ), are given by the symbols ( ). The “Space” metric coefficient is given by the symbol ( ). The “Angular” metric coefficient is given by the symbol ( ). The “Time” metric coefficient is given by the symbol ( ). 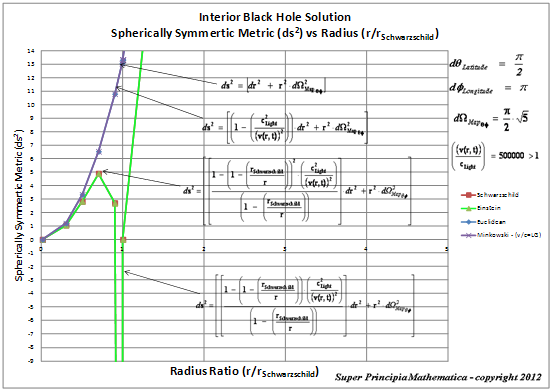 The “Metric Components” of the generalized Spherically Symmetric Metric ( ), are given by the symbols ( ). The “Space” metric component is given by the symbol ( ). The “Angular” metric component is given by the symbol ( ). The “Time” metric component is given by the symbol ( ). 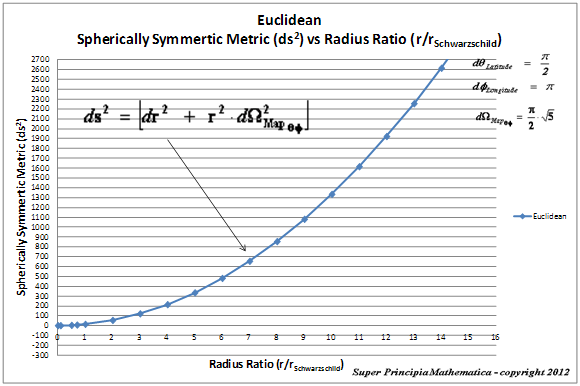 Next we will describe the Euclidean “Flat Space” Metric, its three (3) components and three (3) metric coefficients. The Euclidean Space in three-dimensional Cartesian vector space, with signature (+, +, +), (x, y, z). Next we will describe the Minkowski “Flat Space-Time” Metric, its three (3) components and three (3) metric coefficients. The limits of integration for the Euclidean and the Minkowski “Metrics” and geodesic “line elements” ( ) is described below. Next we will describe the Schwarzschild Metric (Dynamic Vacuum Energy Condition), its three (3) components and three (3) metric coefficients. On an orthonormal basis the Schwarzschild “Dynamic” Space is also a four-dimensional Cartesian vector space with signature (−, +, +, +), (-t, x, y, z). 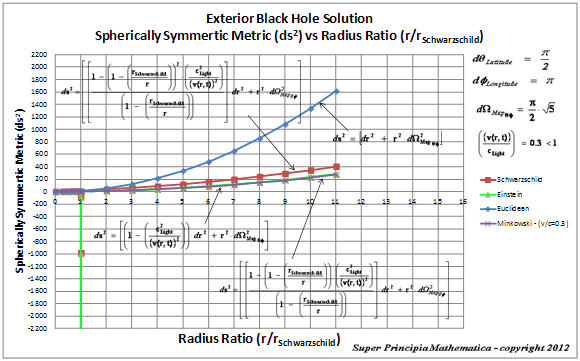 The “Schwarzschild” Spherically Symmetric Metric ( ) “Dynamic Space-time” condition, corresponds to a gradient gravitational vortex system, where the, “Refraction/Condensing Pressure” ( ) on the exterior surface, of the Black Hole Event Horizon, is zero; ( ). 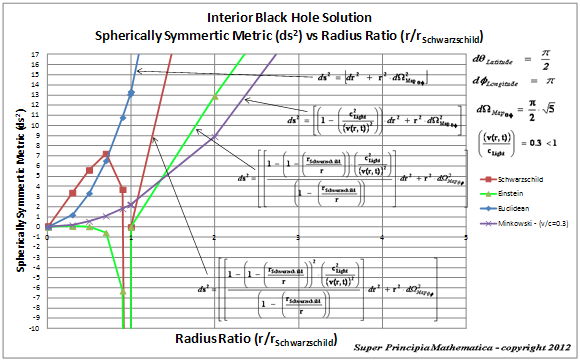 The “Schwarzschild” Spherically Symmetric Metric ( ) for a “Static Vacuum Energy Space-time” predicts a “Physical Singularity” located at zero radius ( ), and a “Coordinate Singularity” located at the Black Hole Event Horizon, Schwarzschild Radius ( ), of the gradient gravitational field. To avoid this problem the mainstream physics community has reject the “Schwarzschild” Spherically Symmetric Metric ( ), in favor of: Kruskal–Szekeres coordinates, Eddington–Finkelstein coordinates, and Rindler coordinate; and which neither have a “Coordinate Singularity”. The “Coordinate Singularity” is not a natural artifact for any Non-Euclidean metric. 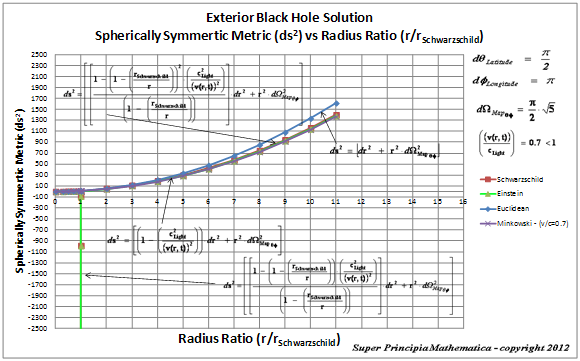 My goal is to find a solution to the “Coordinate Singularity” located at the Black Hole Event Horizon, Schwarzschild Radius ( ), of the “Schwarzschild” Spherically Symmetric Metric ( ). If this “Coordinate Singularity”problem is resolved, the Schwarzschild metric is considered a valid description for the physical description of the curvature of space, space-time, or gradient gravitation field, surrounding, and in the presence of a condensed mass, matter, or energy of an isolated system mass body. The Schwarzschild Metric ( ) “describes” a fluid dynamic vacuum, condition “Rarefaction/Condensing Pressure” of space, where the “Inertial Mass Gravitational Force of Attraction” and the “Isotropic Space-time Aether Gravitational Force of Attraction” interact, and where there is zero Rarefaction Pressure ( ), on the surface of the Black Hole Event Horizon, for any isolated net inertial mass system body. Next we will describe the Einstein Metric (Static Vacuum Energy Condition), its three (3) components and three (3) metric coefficients. On an orthonormal basis the Einstein “Static” Space is also a four-dimensional Cartesian vector space with signature (−, +, +, +), (-t, x, y, z). 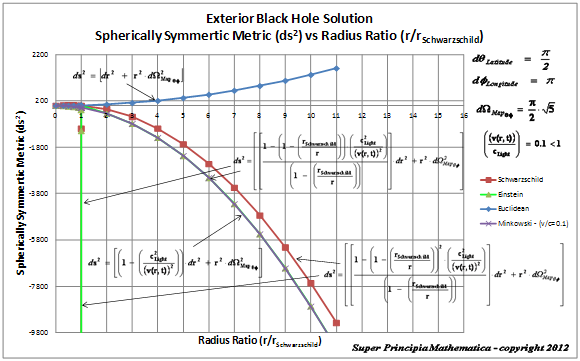 The “Einstein” Spherically Symmetric Metric ( ) corresponds to a gradient gravitational vortex system, where the, Isotropic Aether Gravitational Field Pressure ( ) is equal to twice (2) the “Inertial Mass towards Mass Gravitational Attraction” ( ), on the exterior surface, of the Black Hole Event Horizon, and is non zero; ( ). 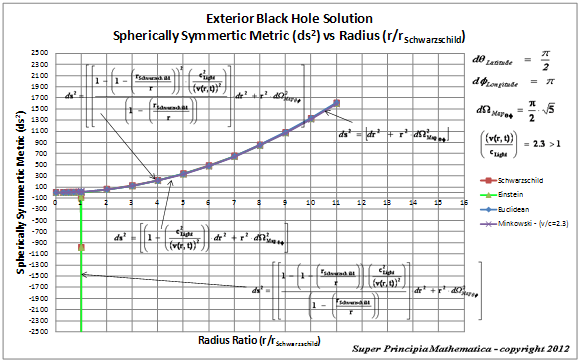 The “Einstein” Spherically Symmetric Metric ( ) for a “Static Vacuum Energy Space-time” predicts a “Physical Singularity” located at zero radius ( ), and a “Coordinate Singularity” located at the Black Hole Event Horizon, Schwarzschild Radius ( ), of the gradient gravitational field. To avoid this problem the mainstream physics community has reject the “Einstein” Spherically Symmetric Metric( ), in favor of: Kruskal–Szekeres coordinates, Eddington–Finkelstein coordinates, and Rindler coordinate; and which neither have a “Coordinate Singularity”. The “Coordinate Singularity” is not a natural artifact for any Non-Euclidean metric. 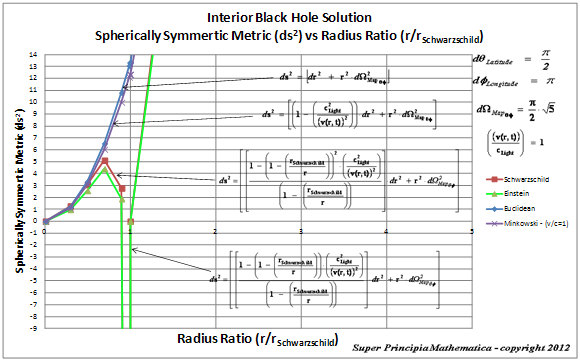 My goal is to find a solution to the “Coordinate Singularity” located at the Black Hole Event Horizon, Schwarzschild Radius ( ), of the “Einstein” Spherically Symmetric Metric( ). If this “Coordinate Singularity”problem is resolved, the Einstein metric is considered a valid description for the physical description of the curvature of space, space-time, or gradient gravitation field, surrounding, and in the presence of a condensed mass, matter, or energy of an isolated system mass body. The Einstein Metric ( ) “describes” a fluid dynamic vacuum, condition “Rarefaction/Condensing Pressure” of space, where the “Inertial Mass Gravitational Force of Attraction” and the “Isotropic Space-time Aether Gravitational Force of Attraction” interact, and where there is non-zero Rarefaction Pressure ( ), on the surface of the Black Hole Event Horizon, for any isolated net inertial mass system body. Next, we will describe “new” two (2) components mathematical formalism for describing the Spherically Symmetric Metric ( ), which describes the Differential Geometry of Space, Time, & Surfaces, of a perfect fluid spherically symmetric space, space-time, or gravitational field; and where there are gravitational interaction in consideration. The “new” forms of the “Spherically Symmetric Metrics” that produce physical and observable results, of matter in motion, through a space or space-time, that is either flat or curved; or has matter present or absent, in that space or space-time. 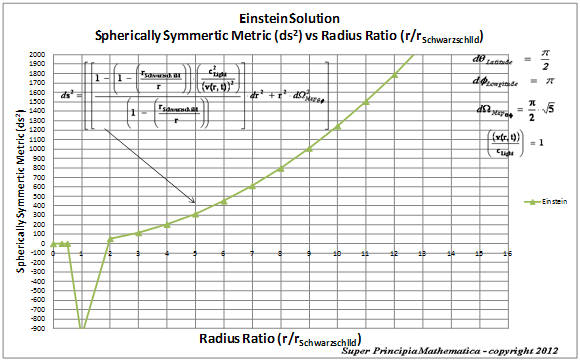 Using the Einstein tensor mathematical expression of General Relativity, it also can satisfy the, Two (2) Metric Components & Two (2) Metric Coefficients, algorithm, for “generalized mathematical formalism” of a “Spherically Symmetric Metric” ( ). 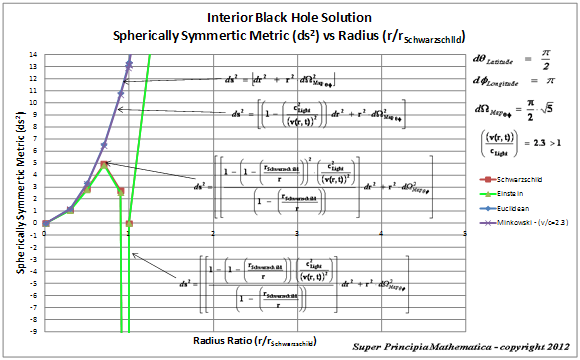 The “new” Spherically Symmetric Metric ( ) algorithm, describes the Differential Geometry of Space, & Surfaces for either the Euclidean Metric, Minkowski Metric, Einstein Metric, or the Schwarzschild Metric, with two (2) components & two (2) metric coefficients. 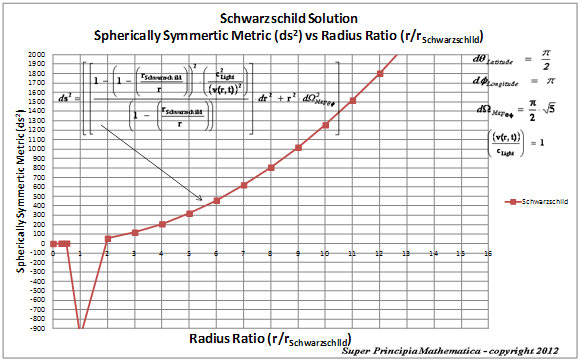 The “Metric Coefficients” of the “new” Spherically Symmetric ( ) Metric, are given by the symbols ( ). 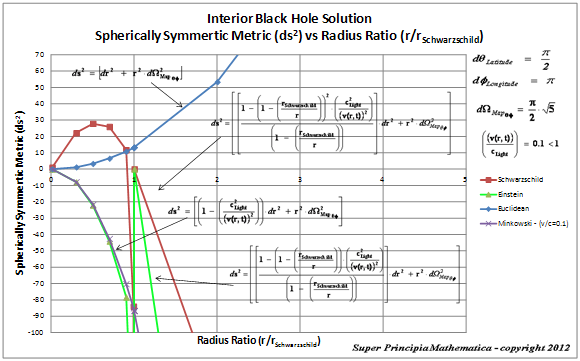 The “Space-time” metric coefficient is given by the symbol ( ). The “Space-time” metric component is given by ( ). If there is “curvature” in a space, space-time, or the gravitational field, then the “flat-space” “Euclidean” geometry is modified and becomes “Non-Euclidean”; and this is described mathematically by varying the value of the “Metric Coefficient” ( ), and multiplying by the differential Radial ( ) component; to get ( ). This work was written to physicists that are interested in understanding from a conceptual view, “Flat Geometry” Euclidean Space, and “Curved Geometry” Non-Euclidean Space; as a description for causality of gravity, or general motion in a gravitational field. The Euclidean and the Minkowski “Euclidean” Metrics ( ) describes the causality and geometry of the “flat” space, space-time, and the gravitational field; and is independent of the condensed mass, matter, or energy absent or present, in a localized region, of a space or space-time, or gradient gravitational field under consideration. The Schwarzschild and the Einstein “Non-Euclidean” Metrics ( ) describes the causality and geometry of the “curvature” of space, space-time, and the gravitational field, and is used in conjunction, with a fluid mechanical model, Perfect Fluid “Static or Dynamic” Vacuum Energy Solution for the causality gravitation; and is dependent of the condensed mass, matter, or energy absent or present, in a localized region, of a space or space-time, or gradient gravitational field under consideration. 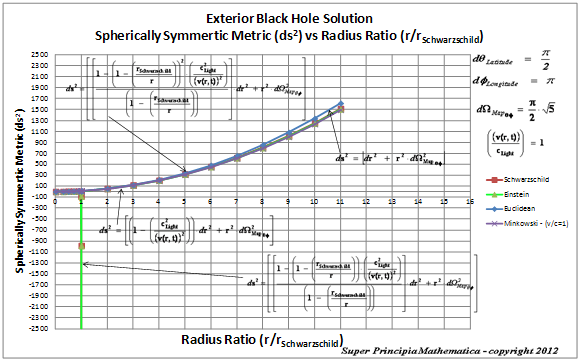 It was demonstrated that the “Coordinate Singularity” ( ) located at the Black Hole Event Horizon, Schwarzschild Radius ( ), is not a natural artifact for any Non-Euclidean metric; and is a problem to be solved. If this “Coordinate Singularity”problem is resolved, the Schwarzschild and Einstein metrics are considered a valid description for the physical description of the curvature of space, space-time, or gradient gravitation field, surrounding, and in the presence of a condensed mass, matter, or energy of an isolated system mass body. The “Physical Singularity” ( ) located at zero radius ( ), is a value that approaches zero, as the radius approaches zero. The “Physical Singularity” ( ) is a natural artifact for any Non-Euclidean metric; and cannot be eliminated. This paper described a new algorithm, for “generalized mathematical formalism” of a “Spherically Symmetric Metric” ( ), that describes the Euclidean Metric, Minkowski Metric, Einstein Metric, or the Schwarzschild Metric; using an algorithm which is composed of, Three (3) Metric Components & Three (3) Metric Coefficients; and likewise an algorithm using Two (2) Metric Components & Two (2) Metric Coefficients. This entry was posted in The General Theory of Relativity and tagged Aether, Black Hole Event Horizon, Coordinate Singularity, Curved Space-time, Einstein Field Equation, Einstein Metric, Euclidean Geometry, Flat Space-time, General Relativity, Geodesic, Gravitational Field, Gravity, Metric Theory of Gravitation, Minkowski Metric, Non-Euclidean Geometry, Perfect Fluid Vacuum Energy, Physical Singularity, Schwarzschild Metric, Space-time Curvature, Special Relativity, Spherically Symmetric Metric. Bookmark the permalink.